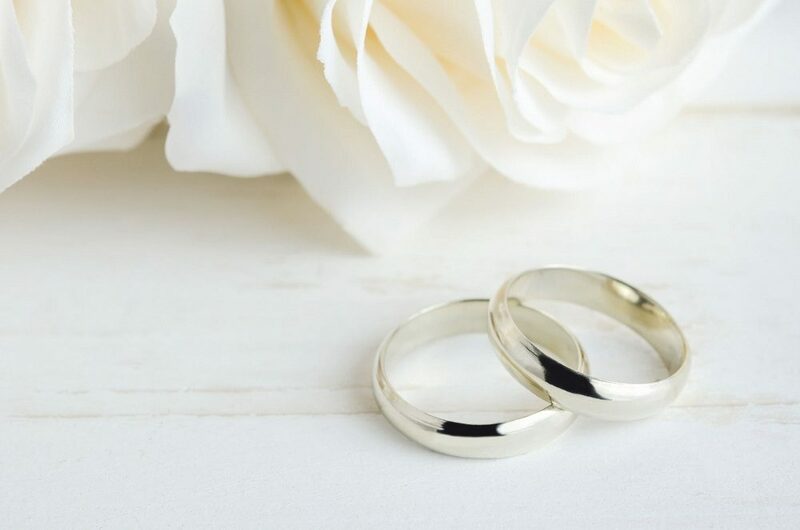 Not only is white gold both classic and versatile when it comes to wedding bands, it’s also the go-to choice for many couples who want a white or cool metal look rather than yellow gold. You can make a bold statement by pairing white gold with colored stones, or go traditional by pairing it with white diamonds. Buying white gold requires a bit of education before diving in. You should take time to compare white gold to other white metals, learn about purity and karat weight, and understand color and pairing guidelines so you know if white gold is the right choice for you. White gold has a similar appearance to platinum and sterling silver, but still might be a better choice for wedding jewelry. 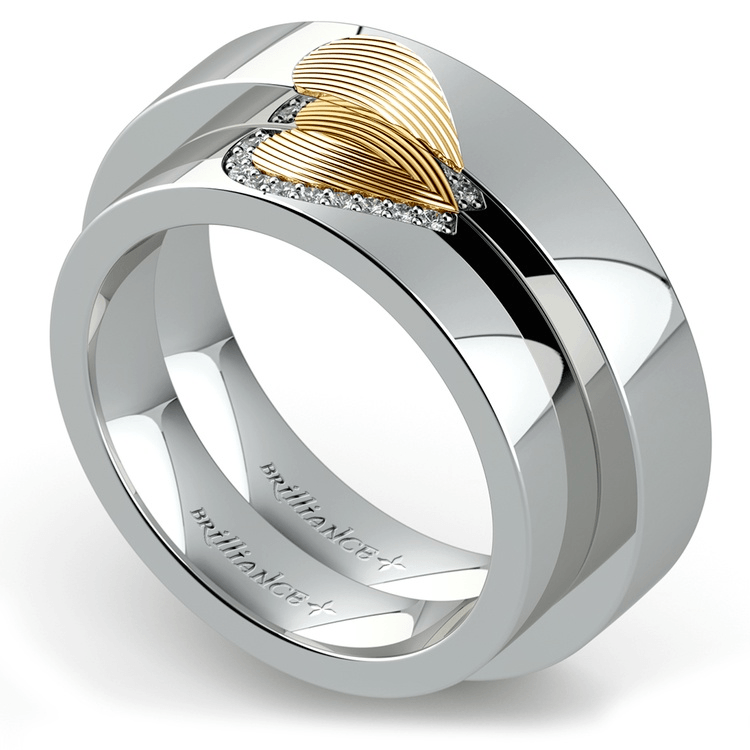 The color of white gold is achieved by mixing yellow gold with metal alloys. This process not only gives it a silvery appearance, but also helps to make it more durable. Platinum is an incredibly durable metal, which makes it a popular choice for wedding rings, but it tends to carry a rather high price tag. Brides who want the luxury of platinum, without the expensive cost, tend to choose white gold instead. It’s affordability allows it to shine brighter than platinum in the eyes of budget-conscious consumers. Sterling silver is a much cheaper alternative to both white gold and platinum, but there are many factors that make it a poor choice for fine jewelry like wedding bands. Although silver is a fantastic choice for simple pieces featuring less expensive gemstones, like turquoise or amethyst, it’s too malleable for expensive gems. Sterling also tarnishes easily and requires frequent polishing. White gold, however, doesn’t tarnish, making it a low maintenance choice. White gold’s purity is measured in karats. A karat is a unit measurement for gold that’s equal to 1/24 part of pure gold in an alloy. This means that pure gold is denoted as 24 karat, 18 karat gold is 75 percent gold with 25 percent of the composition consisting of other metals, 14 karat gold would be about 58 percent gold, while 10 karat gold would be about 42 percent gold. If high purity is a selling point for you, opt for 14 or 18 karat white gold. Keep in mind that most white gold is created by using alloys such as palladium, manganese and nickel. Many buyers avoid white gold that is created with nickel, as nickel metal is commonly known as an allergen. 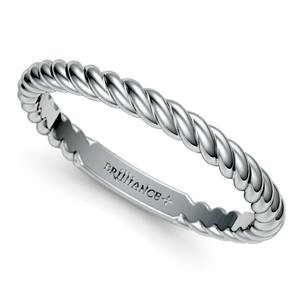 However, both palladium and manganese are great options for a hypoallergenic band. If you want a little extra bling in your wedding band, the mirror-like surface of white gold will capture the fire and brilliance of your diamonds. White gold is an ideal choice for displaying colorless or nearly colorless diamonds. Pave or channel set white diamonds, in particular, look crisp and amazing in white gold wedding bands. On the other hand, the yellow undertones of a lower grade diamond may be accentuated in this cool metal. Buyers who wish to mask their slightly colored diamond should choose a yellow or rose gold setting instead. That doesn’t apply for fancy colored diamonds such as canary yellow, champagne, black, pink, or brown. 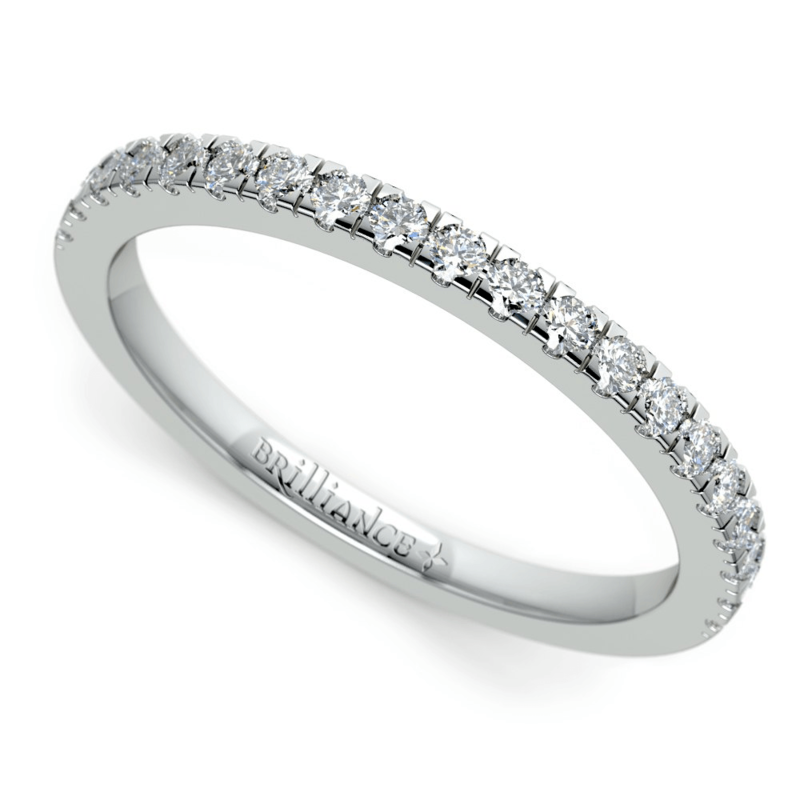 These diamonds will undoubtedly pop against a cool white band. 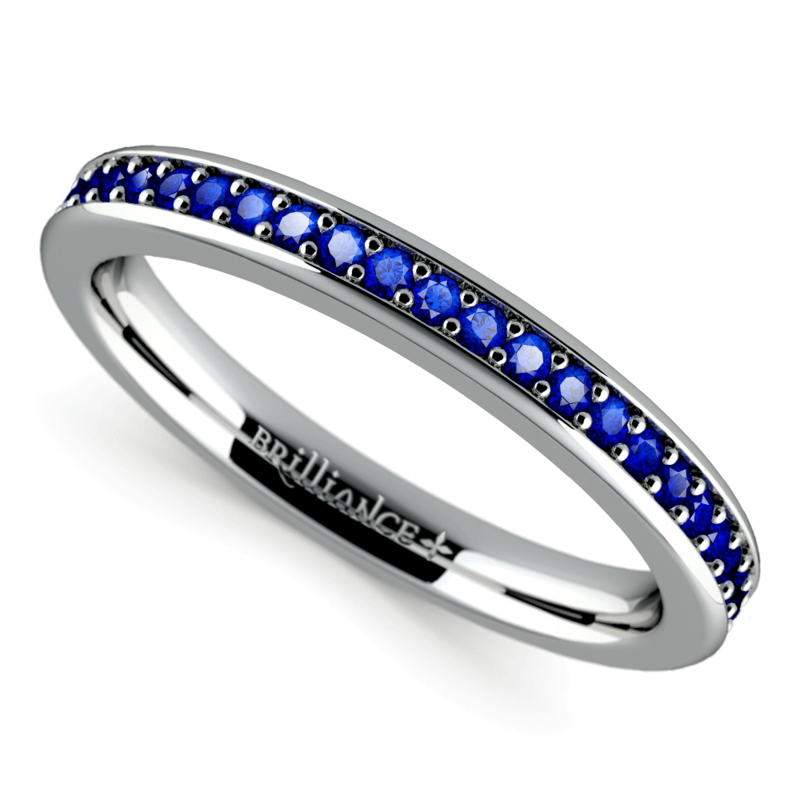 White gold is also a great canvas for displaying colorful gemstones. Rubies and sapphires (both blue and pink) are the most popular pairings for women’s wedding rings, while onyx and black diamonds evoke a unique, dark contrast for that one-of-a-kind bride. Past trends dictated that white metals should be paired with other cool colors. Today, Pinterest and Instagram influencers don’t play by old rules. You’ll commonly see silver accessories with warm earthtones, but you’ll also find gold jewelry paired with cool hues like crisp reds. Mixing metals is a great way to create depth and interest. Don’t shy away from pairing women’s wedding rings in white gold with a rose gold band or engagement ring; play with colors and textures to express your style. If you’re uncertain about what wedding ring would fit best with your engagement ring or personal style, contact a jewelry expert to help you pick or even design your perfect custom ring! White gold is a favorite choice for a ring setting when you want the look of platinum without the high price tag. The reflective surface of the cool-hued metal makes it ideal for displaying colorless diamonds, or allowing colored diamonds and gemstone to shine as a focal point. Like other cool-toned metals, white gold offers a versatility that allows it to play well—and pair well—with your entire wardrobe!